I don't make new years resolutions, but I did tell myself I need to find the perfect mug for tea (ha). It's the little things, isn't it? And we have no mugs. We do have two cute wedding ones (thanks mom G!) but they're thin with a small handle so I don't use them for hot beverages. 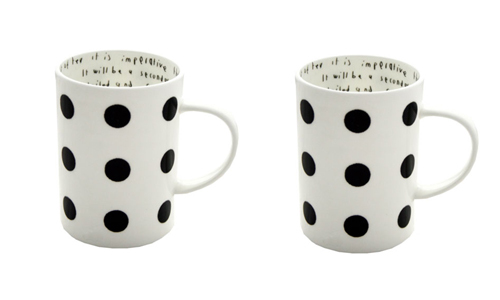 I think this polka dot mug wins. agreed! the writing on the inside is my favorite part. Hey those are cute! I love the writing on the inside. oh! those are so precious!! i love polka dots! i think they make the cutest things even cuter! Oh, my - I am addicted to mugs!! :) Seriously, I love the idea of having lots of different mugs. This way when people come to visit they will all have a unique mug that they like the best.